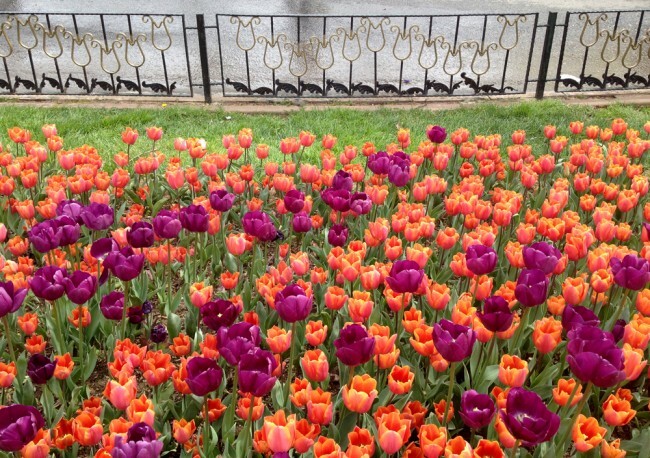 Throughout the month of April the entire city of Istanbul celebrates tulips. Tulips originate as a genus in Persia but Turkey does remarkably have more variety of plants than all of Europe. Istanbul's mayor Abdelkadir Topbas first introduced the festival in 2006 and also inspired a lot of other cities in Turkey to have annual tulip festivals. All the millions of tulips are grown in Turkey and they are grown for domestic plus export purposes creating a great annual economic stream for the people working in that industry. 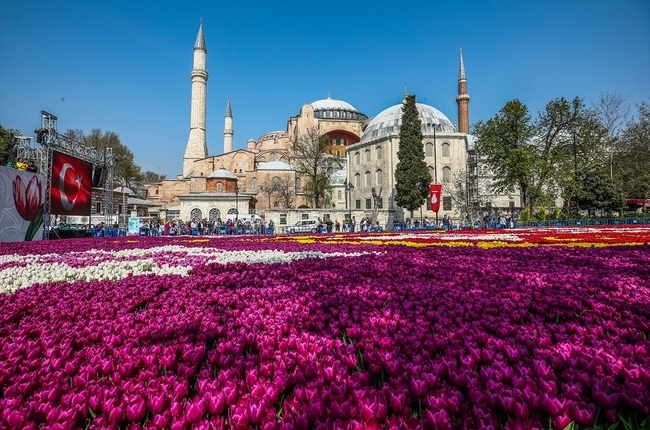 There are tulip festivals all over the globe and Turkey is a giant part of that celebration of a shared global connection and history. In the aptly named Tulip Period, in the time of the Ottomans when Sultan Ahmet III reigned, there were more than 800 species of tulips that were cultivated and catalogued and each had its special name in Turkish, for instance rare tulips were named: "Those that burn the heart", or "Light of the Mind". The universal symbolic meaning of the tulip is 'perfect love' which also comes from the Turks. Tulips are the most ephemeral of all the flowers with the bloom lasting only a short time even so making them somehow more precious. Taksim Square – In the center of Istanbul connected to the long expanse of the pedestrian only area of Istiklal Street. Sultan Ahmed Square – The city annually prepares the world's largest Tulip carpet display. Each year designers come up with new intricate designs. This area is the square next to Sultan Ahmet Mosque. Göztepe Park (Göztepe Gül Bahçesi) – Located on the Asian side of Istanbul it has a large amount of events as well as the viewing gardens. Beykoz Çamlıca Korusu – On the Asian side along the Bosphorus which is great for walking. Yıldız Park – Near the Yıldız Palace which was a Sultan’s private hunting area. There is a forest and old pavilions. Çamlıca Hill – Thousands of tulips line the long walk on the way up to the highest point in Istanbul. Emirgan Grove (Emirgan Korusu) – this park is said to be best for the artistically unique and interesting plantings and it is one of the largest public parks in Istanbul, located by the Bosphorus Sea in Sariyer, which is a little bit past the second Bosphorus Bridge. This Grove is a very special area in Istanbul as it was the estate of Khedive İsmail Pasha of Egypt (reigned 1863-1879). The numerous villas in the grove which Khedive (King) of Egypt built still exist and they are now used as cafés, meeting areas, and exhibition spaces. A really interesting one is Sarı Köşk (The Yellow Pavilion), an Ottoman-Victorian style architecture building with an open-air terrace that has Bosphorus views. Emirgan Grove is the headquarters of the festival and is open daily from 07:00 until 22:30. As with Göztepe on the Asian side, this site has events planned every day between 10:00 and 19:00 with traditional musicians, actors and other performers, calligraphy demonstrations, glass blowing, art workshops, painting, sculpture, photo exhibitions, numerous tulip species and tulip related products are also on sale. There will also be demonstrations of Ebru Art which is known as 'Painting on Water'. Ebru works of art are created by floating or putting oil based paints into water which do not mix and then transferring the natural designs onto sheets of paper, fabric, and canvases. There is a photo competition in which the 50 most beautiful tulips in all the festival will be selected. These spring flower displays that are seemingly made up of every shape and color start in late March and continue thru early May. There are so many places to see the tulips as the city is immersed in the festival and just a few other locations not listed above are Soğanlı Bitkiler Park, and Gülhane Park. Daffodils, blooming trees and hyacinths are also a huge part of the displays. Great outdoor and indoor cafes and park pavilions, streams, fountains and sea views and the quality of the attention to detail given by the city to the parks enhances the experience of the whole festival.